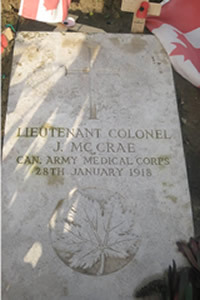 Although John McCrae was born in Guelph Ontario, his parents were Scottish immigrants and his father, Lieutenant Colonel David McCrae, had a long military history. In creating the music for the In Flanders Fields song, composer Anthony Hutchcroft arranged the piece with a Scottish feel, including bagpipes, flute and accordion in the instrumentation to reflect John McCrae’s Scottish heritage. To reflect McCrae’s military experience, the Flanders Fields song is supported with the marching cadence of a military drumbeat. Out of respect for the reverence afforded this poem over the past nine decades, the composer chose not alter a word of the text and endeavored to remain as true to the rhythm of the poem as possible. He also kept the melody and chord progression diatonic to make the Flanders Fields song more like an anthem. TIME: This lesson plan may take 2 – 3 (45 minute) classes or can be edited as required. Students will analyze the structure of the In Flanders Fields song, a music adaptation of John McCrae’s In Flanders Fields poem and through application, explore the composer’s use of rhythm, melody, harmony & instrumentation to express the poem’s text and message. This lesson will also help students to explore how the composer uses music to reflect John McCrae’s military and Scottish background. Start this lesson by playing the CD recording of IN FLANDERS FIELDS song and reviewing the text in Data Sheet #6. Listen to the music CD of IN FLANDERS FIELDS song and review the information in Data Sheet #6. The musical analysis will discuss the use of rhythm and melody including variation and emphasis for both plus the use of diatonic harmony, instrumentation and musical arrangement. What compositional elements are used to affect the poems mood and message? Why did the composer choose the instrumentation he did and how does the arrangement complement the poem’s message? Students should explore these and other questions. Copyright © 2008-2013 Anthony Hutchcroft All Rights Reserved.